Ya Jagoff!!! | St. Patrick's Day Jagoffs! Home Drunk Jagoffs St. Patrick’s Day Jagoffs! Saturday we put a Facebook and Twitter call out for St. Patrick’s Day Jagoffs. Our followers did not disappoint. Above are two of the pics we received. This guys was challenging his friend to a leg wrestling match……at 715am. — at Casey’s Irish Pub. 7:15am, and he’s already on the floor challenging someone to leg wrestle which, sounds a lot like ANOTHER infamous drinking game, that SEEMS like good idea when you and your buddy are drunk, called, “Let’s see who can punch the hardest.” THAT game usually ends with two best-buddies in the hospital getting stitches in their respective faces. And if you wnt proof that this guy IS drunk this early, NOTE, he’s sitting on a bar floor that NO DOBUT has seen it’s fair share of errant natural and manufactured fluids and other substances! This man was WASTED outside of the Tilted Kilt last night at 6pm!!!!! 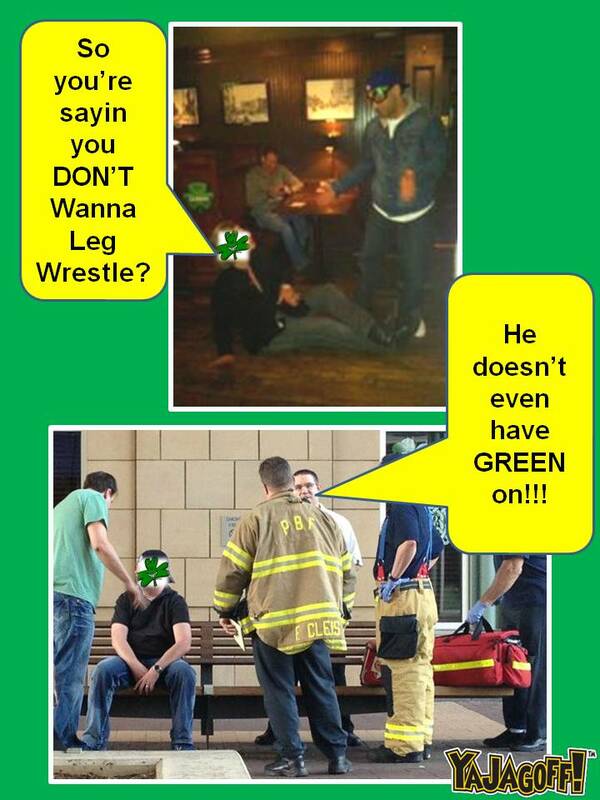 The fire dept, EMS, and police were there with his drunk ARSE. St. Patty’s day, or is it St. Paddy’s Day???? Well, either way, it did not disappoint us for some entertainment and neither did our followers. Hey Floor Boy, you MAY gave been wanting to leg-wrestle but let’s be more reasonable and say you were trying to do a horizontal version of River Dance! And Bench Boy, well, it’s never a party until the Fire Department is called, right?? And to you both, what is it about St. Patty’s day that makes ya feel you’re a bottomless beer pit with a liver the size of Connecticut, Ya Jagoffs? Thanks to these Honorary Jagoff Catchers, Bill H. of Cheap Shots Comedy Group for the L.A. hook-up and “Julie” for the Pittsburgh pic. You can see some of our other Drunk Jagoff posts here. Previous articleI’m A Little Confused On Where The Carts Go!